Alternative Apparel, online at AlternativeApparel.com, is your premium source for fashionable yet comfortable clothing. Alternative prides itself on the signature vintage softness of the clothes in the company’s line, which is made casual, authentic, and eco-friendly. Alternative offers a wide variety of tops, bottoms, and outerwear for women, men, babies, and toddlers, plus accessories including scarves, headwear, and bags for all. You can also choose to shop online by seasonal collection at Alternative. For all the best Alternative discounts, Alternative coupon codes, and Alternative promotions, check out RetailSteal.com. Alternative Apparel ships via FedEx within two business days when your ordered items are in-stock. They ship to anywhere in the United States, but rates vary based on destination and price of order. Shop at Alternative Apparel and enjoy 25% savings on your order. Click here for code. Shop the sale section at Alternative Apparel and enjoy up to 75% off a wide range of apparel and accessories. Sign up with Alternative Apparel and save 15%. Click link to start. Download the Alternative Apparel iPhone application for free when you shop online. Click link for free download. 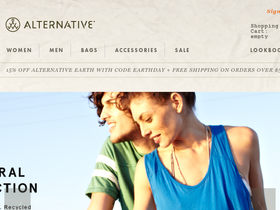 Shop online at AlternativeApparel.com and enjoy free shipping on all orders. Click here to shop. Click through here to check out Moosejaw's latest coupon codes and offers.